The MetroStars tied their Eastern Division rival D.C. United, 2-2, before a crowd of 10,316 at Giants Stadium in East Rutherford, New Jersey. The tie, the first in the history of the Metros, makes the club 7-7-1 (22 points) on the 2000 MLS campaign and moves them to within three points of the front-running New England Revolution who take on the Earthquakes out in San Jose later this evening. The Metros, unbeaten in three games against United (2-0-1) this season, clinch the season series over their fierce rival for the first time in franchise history. The Metros also remain unbeaten this season (7-0-1) in games where they score two or more goals. The Metros jumped out to a 1-0 lead in the 18th minute on Clint Mathis' seventh goal of the season. Midfielder Tab Ramos lofted a free-kick into the box that Mathis headed towards the United net. D.C. keeper Mark Simpson got a piece of the ball before it bounded over his head and into the back of the net. Mathis, who now has four goals in six games as a Metro, showed his love to the hometown fans following the goal. Mathis pulled up his jersey over his head to reveal a T-Shirt imprinted with "I LOVE NY", a move that is quickly becoming his signature calling card. Mathis revealed the shirt for the first time back on June 3rd against his former club, the Los Angeles Galaxy, following his tally of the eventual game-winner. The Metros stretched their lead to 2-0 in the 23rd minute on Tab Ramos' first goal of the season. Adolfo "El Tren" Valencia played the ball across the top of the United box to a wide-open Ramos at the near side. Ramos settled the ball before sending a blistering shot on the United net from 22 yards out that beat Simpson to the lower left corner. 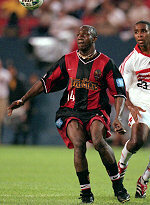 Ramos scored his last regular season MLS goal back on 8/18/98 versus Colorado in a 4-1 Metros win. United broke through in the 51st minute on Chris Albright's second goal of the season. Jaime Moreno brought the ball into the Metros box and attempted a shot that deflected off a Metro defender and came to Albright at about 10 yards out. Albright slid into a shot that beat Mike Ammann and rolled into the Metros net before Thomas Dooley could clear the ball off the line. United got the equalizer in the 86th minute on Jaime Moreno's ninth goal of the season. Marco Etcheverry played a free kick deep into the Metros box that teammate A.J. Wood headed over to Moreno at the far back post. Moreno out-jumped defender Mike Petke and headed the ball into the lower left corner. Lineup: Ammann, Dooley, Jolley, Petke, Shak, Chung, Walsh, Ramos, Corrales, Mathis, Valencia. Subs: Perez, Myers.